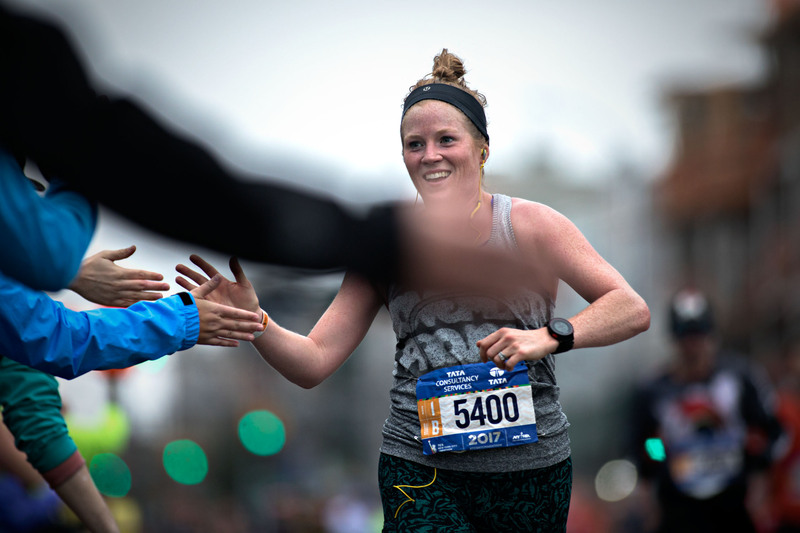 Jen Elliott isn’t only running the NYC Marathon on November 5th, 2017 with about 50,000 others, she will run it with the support of the entire Edmonton running community. I’ve never believed a single statement to be so genuinely true, factually accurate, and vitally important. Jen Elliott doesn’t mix words, nor fill the empty gaps between sub 4:30/km breaths with useless rhetoric. And her smile that stretches her freckled cheeks out to her ears, simply can’t lie. It really will be so much fun. Following Jen for a week prior to her race is just the appetizer to the amount of fun New York City will be. We run across the High Level bridge, our footsteps and breathing the only two noises breaking the dark silence of a 6am Friday morning run through the Edmonton River Valley. We are discussing New York. The temperature is starting to settle closer to zero late in October. It’s still dry, so despite the cooler temps, running outside is absolutely delightful. Jen has been fortunate on this training cycle with near perfect weather for the last couple months. Edmonton has seen very little rain, and a long shoulder season of remarkably malignant temperatures — not too hot and not too cold. Not that it would matter if it wasn’t. Jen will train in anything. There is nothing fancy or special about Jen’s training. It’s rather unassuming. She doesn’t have a run coach. She doesn’t have a personal trainer. There are no scheduled weekly physio appointments or massages. Jen doesn’t read all the running magazines changing her training philosophy monthly or bounce from one fad diet to another. There is nothing shiny about Jen’s success as a runner. Jen Elliott simply puts in work. Her training is unrelenting, like the roar of a train barreling across the Canadian prairies. She’s committed to herself and her crew. She’s adopted the “race everything” mentality. 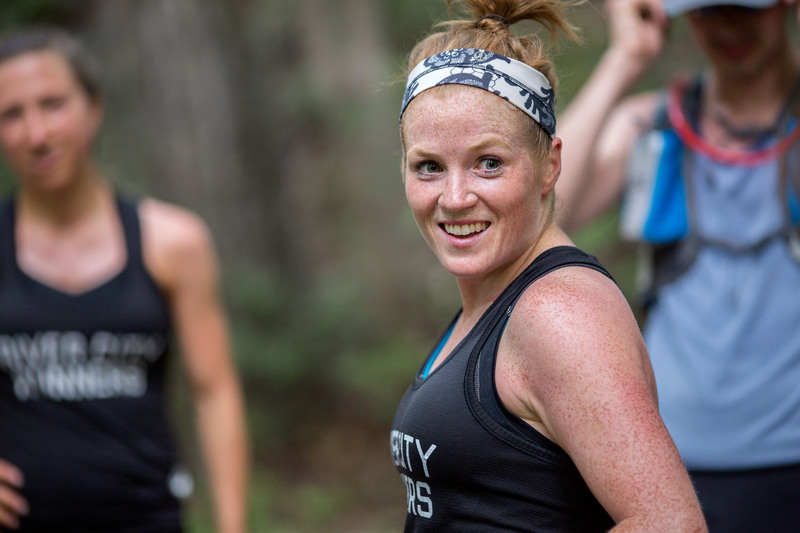 For the past four years, Jen has been just showing up to stairs and hills with November Project (NP), hot lapping solo intervals of Hawrelak Park in 30C heat, busting up tempos with the crew on “sk drive” in the rain, slipping through workouts in the snow on River Valley Road, as well as HIIT’ing at Blitz. Jen loves yoga and practices often. She has a regular Thursday morning strength crew that stems from her friendships rooted in NP. 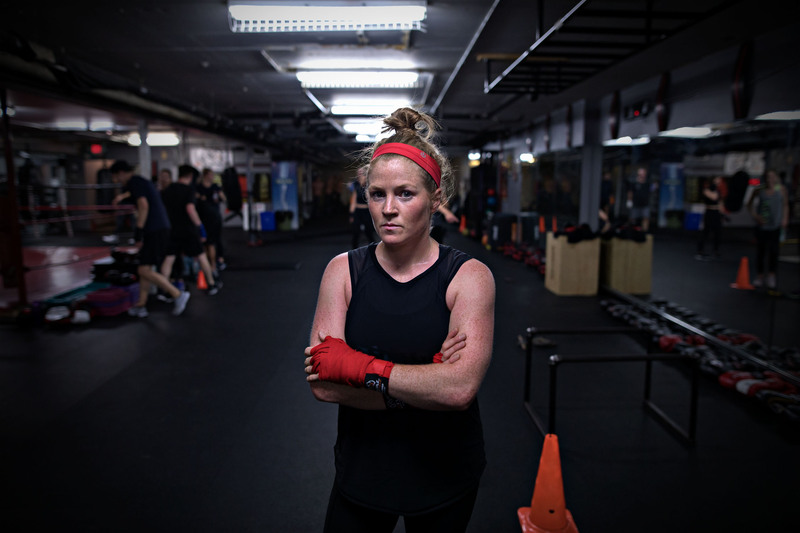 The secret to Jen’s success, and the multi-dimensional approach of her training, is her massive network of friends she’s created in the Edmonton fitness community — leading to some incredible adventures. Jen’s Instagram this summer has put most people living in Canmore to shame. She has seemingly hiked, climbed, and ran anything and everything — surrounded by other smiling faces. When someone says they are going to a workout, Jen puts her hand up. When you need another runner for a leg of Sinister 7, Jen throws her top bun into the ring. 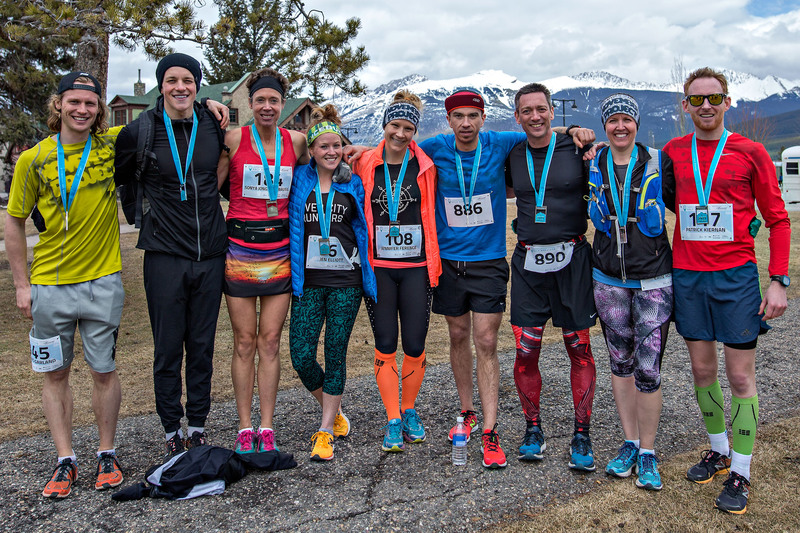 Tackle the Jasper Skyline’s 45 KM trail run over three passes? Yup, Jen’s in. Throw in back country hikes and canoe trips and you start to get the idea. As much as Jen has been out there, she’s equally put in work throughout Edmonton. Ten days out from her race, I photograph Jen’s drop-in boxing workout at Panther Gym. Ryan Luider is the catalyst of this latest sweat session in the dark and moody gym below street level on 112th. Jen’s training might not be fancy, but it isn’t boring. Jen Elliott is the poster child of consistency, and a well balanced training schedule that has afforded her a lot of injury free miles the last couple years. There has been no grand plan behind her success. No late evening scheme hatched at a whiteboard that is playing out. I swear her only goal is to workout with other people. Race with other amazing folks having fun out on course. The NYC Marathon was never part of the script, it has just kind of happened. Jen’s running story is no different — it just kind of happened. It all starts with November Project in 2014, and blossoms from there. Connection after connection, training run after training run, workout after workout, and race after race. Jen has constantly just shown up — putting in work every step of the way. Starting from the outside and slowly, but steadily, Jen has worked her way into the heart of the bounce. Into the heart of the Edmonton fitness community. It will be this community that pushes her for 42.2km’s through the five boroughs of New York, and across the finish line. The irony is not lost on me. I speak of Jen’s simple — lustre-free — training, while she prepares to conquer the world’s largest marathon. One of only six majors on the calendar. Arguably the biggest running stage on the planet. It seems perfectly fitting that this will be her first marathon. I can see her now. Wearing a three quarter length Lululemon tight, Swiftly singlet, and a headband just below that familiar red top-bun — glowing in the beautiful late fall east coast sun. Standing in the starting corral on the Verrazano bridge. Arms straight, hands clasped together in front of her, looking down at her feet. Patient. Waiting. Like I’ve seen a thousand times before, posed at stop lights on training runs. I can see Jen standing there, and a family of runners from Edmonton with their hands up, ready to push. Time to rip 3 hours of so much fun. See you out there J Elliott. Let’s just say Jen has a bit of a race on the perfectly cool 5th day of November in New York. My favourite moment of the entire week comes the following Monday at breakfast after a November Project workout at Bryant Park. The NY Times publishes every single marathon finisher and while the single copy gets passed around, I casually mention that Jen should just look at the end of the first page. A smile emerges across Jen’s entire face, that even I haven’t seen before. Months of training culminate in seeing her name—albeit near the bottom of the page—on the first page of results in the NY Times. 1968 of 50,646 others. In her first marathon. In the biggest marathon on North American soil in the calendar year. The 172nd female across the finish line. The 4th Canadian woman to finish the 2017 TCS NYC Marathon. 3:11:20 official chip time. Her 5KM splits makes Jen’s race even more incredible. Ummmmm, see a pattern? In the first 35KM’s of her debut marathon, Jen run’s 5km splits no more than :38 apart. Sure, she might have been able to pull a bit of time out running a slightly slower front half to push a little harder to finish, but these splits are nothing short of incredible for the NYC Marathon, let alone a debut on this demanding course. True to the hype, Jen comes pulling through the rolling hills of Central Park strong and consistent — relentless rain still sprinkling down around the runners. So many others are flailing about. Falling further apart with every step. Not Jen. Yeah, she’s working, but less than a couple KM’s from the finish, Jen is Jen. Unassuming. Focused. Not letting the excuses in her head for three-plus hours hold her back. Putting in work. Looking strong. Jen Elliott’s 2017 NYC Marathon.